Due to high blood pressure, my doctor has recommended I go on a low-sodium diet. So, that got me wondering what it is about sodium that drives this recommendation? What does sodium do to a body that, by its presence or absence, affects blood pressure in humans? The basic reason is osmosis, the tendency of solutes to move from an area of high concentration to one of low concentration across a permeable barrier. So, ingesting large amounts of salt results in a high sodium concentration in the blood stream. This in turn causes water to enter the blood vessels by osmosis. More water in the blood means a greater volume of liquid and, therefore, higher blood pressure. With low salt concentrations, water exits the loop and is retained by the body. When sodium concentration is high, the opposite occurs, water enters the blood stream by osmosis and increases blood pressure. As salt accumulates in thebody, it also indirectly increases the extracellular fluid volume for two basic reasons: 1. When there is excess salt in the extracellular fluid,the osmolality of the fluid increases, and this in turn stimulates the thirst center in the brain, making the person drink extra amounts of water to return the extracellular salt concentration to normal. This increases the extracellular fluid volume. 2. The increase in osmolality caused by the excess salt in the extracellular fluid also stimulates the hypothalamic-posterior pituitary gland secretory mechanism to secrete increased quantities of antidiuretic hormone. The antidiuretic hormone then causes the kidneys to reabsorb greatly increased quantities of water from the renal tubular fluid, thereby diminishing the excreted volume of urine but increasing the extracellular fluid volume. Thus, for these important reasons, the amount of salt that accumulates in the body is the main determinant of the extracellular fluid volume. Because only small increases in extracellular fluid and blood volume can often increase the arterial pressure greatly, accumulation of even a small amount of extra salt in the body can lead to considerable elevation of arterial pressure. 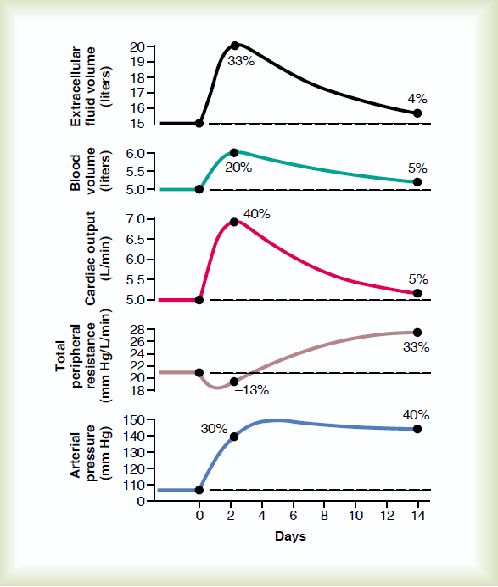 Progressive changes in important circulatory system variables during the first few weeks of volume-loading hypertension. Salt will cause high blood pressure, but only under certain circumstance. while these horomones help with the kidney regulation of sodium balance and blood volume, this still depends on the kidneys being given the circumstance where they can be effective. The kidney: A patient with renal disease may not be able to regulate the excretion of sodium. 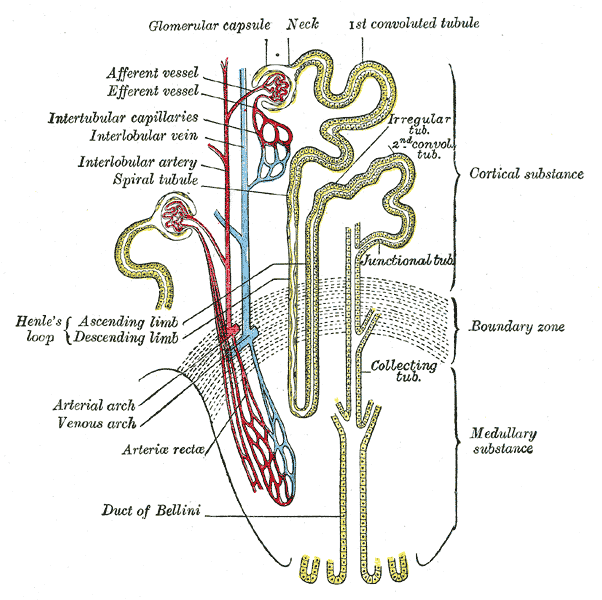 Even in normal humans, the kidney's capacity to excrete sodium declines with age, and smaller increases in salt intake induce a rise in arterial pressure, as GFR (the renal filtration of the blood sent to the kidney) falls by about 40%, though individual variations are wide and some people lose less. Other than the kidney: Other diseases can also interfere with renal excretion of sodium. A problem with maintaining blood volume will cause constriction of the renal artery. This would occur before a drop in blood pressure would occur, as this is a way of preventing a drop in blood pressure. This occurs in congestive heart failure and liver cirrhosis. A patient with congestive heart failure may not have adequate renal perfusion. Hence, to maintain adequate blood pressure the renal artery is constricted. Also, liver cirrhosis may decrease renal perfusion because of the lack of blood proteins (proteins found inside the blood vessels that keep water in the blood vessels via osmosis) holding fluids in the intravascular space and having them escape into the extra-vascular (outside the blood vessels but still outside the cells of the body) space. Again, to maintain adequate blood pressure the renal artery is constricted. In addition to reduction of salt in the diet, diuretics (ex. loop and thiazide) can help the body excrete even more sodium into the urine than what your body can do on it's own. Not the answer you're looking for? Browse other questions tagged human-biology cardiology food or ask your own question. How does Bernoulli’s Principle apply to the cardiovascular system?